I have been so busy that I have loads that I haven't had time to blog but I'll start catching up with the card made using Bea's Ismaki challenge sketch (rotated 90°) AND the sewing option! 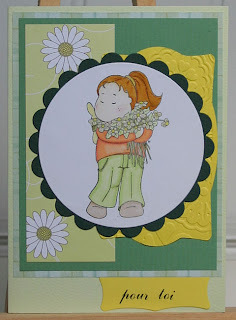 Tilda coloured with Whispers markers; papers: 'Olivine' by Papermania; flowers: Prima and Imaginisce. I coloured Tilda with Whispers pens and used 'icicle' Twinkling H2O to add sparkle to the daisies and used the Nestabilities classic and scalloped circles to cut the mats. I used the middle frame from the Spellbinders Frameabilities that I cut the other day for the right-hand mat, embossed with the Cuttlebug, and used the centre bit from the frame for the sentiment tab at the bottom (nothing gets wasted!). 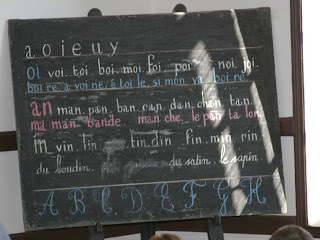 The French-looking script is actually W H Smith (a very British chain of newsagents in the UK) rub-on lettering! 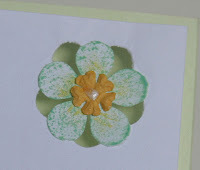 Don't know about the other paper and card but the daisy paper is from PaperMania Creative Tones Olivine Essence pack. Inside I just used ordinary printer paper and punched a flower in the bottom corner, inked this with Colorbox fluid chalk Iced Jade direct to paper and dabbed my paintbrush into yellow Brilliance and painted on a hint of that too, added a tiny Prima and a dab of 3D pearl paint. I stuck this back down, turned so that the punched hole also shows through. Another Magnolia with the PaperMania 'Scrumptious' papers for Kimmie's 5th challenge of using patterned papers and heart(s): Not difficult that one ! Looks rather plain in comparison to yesterday's but every time I try some embellishment against it I prefer it left as it is. 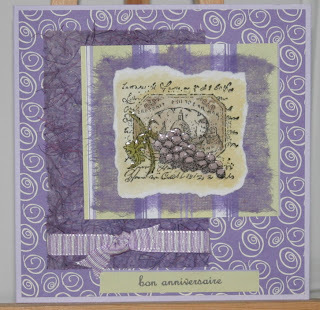 This card follows the sketch 09/006 over on the Ismaki blog this week and hits the option of using buttons, while Kimmie's 3rd birthday challenge was to use pink and at least one button: Magnolia image coloured with Whispers pens; PaperMania 'Scrumptious' papers and gems; Prima flowers; Making Memories button; stamps: Compagnie d'elfes text and Inkadinkado flourish. This one is for my sister's birthday today, so I hope she's got it! I think the FF decoupage packs are great although I haven't yet come across die-cut découpage that I don't still feel the need to improve with a good cut! 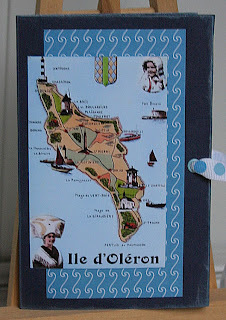 I've been sitting in the evenings découpaging (anglicising a french word!) and have a big tub full ready to mount on to cards now! This one is mounted on a Nestabilities Scalloped Oval, cut, inked and butted against some adhesive ribbon hiding the join of 2 printed papers from the pack. Wish I'd taken a photo of it lying down: That individual smartie in the front has 6 layers!!! Thanks again Kimmie for spurring me in to action but I have got to work fast now to keep up with the deadlines - Thanks goodness for the time difference! Challenge 2 is to follow a layout with dry embossing so I made this card this morning with the pieces left from yesterday and my new Spellbinders 'Frameabilities' although I was a bit disappointed as I thought the frames came separately like the Nestabilities but in fact it is all one piece and the outside edge of the largest frame doesn't get cut: Can think of times that will be useful though! To top it off, I can't find my tan mat so embossed with Cuttlebug divine swirls instead! 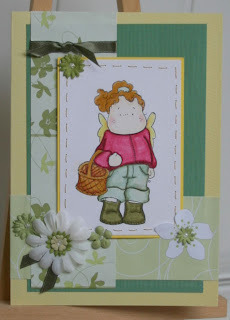 Gorgeous Sugar Nellie image coloured with my Whispers pens. 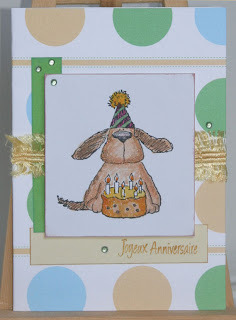 Kimmie's 4th birthday challenge is to make a card with an animal and ribbon and I turned the sketch for A Spoon Full of Sugar challenge to make this card. I love the rabbit - I won him from Sally of Bootiful Stampz - Thanks again Sally :) If you scroll down the shop page here there are lots more stamps featuring this cute little bunny! Great for Spring and Easter ! 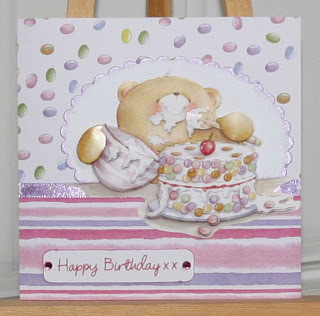 Kimmie's blog has been on my list of those I visit for ages and when I hopped over this weekend she had just finished a series of birthday challenges so I intend to catch up with some of those to say 'happy belated birthday'! 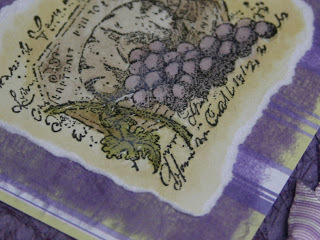 The first is to create a birthday card with purple: I used a Stampin Up image I coloured with Distress inks and then I 3D glossed the grapes. 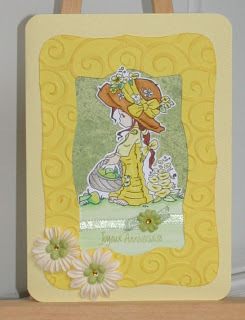 The stripy paper is from the DCWV Floral Prints stack, the swirly paper is PaperMania and the ribbon is Anita's. One of the styles of mini-album I have been making lately is this 3-fold album where I take a piece of 15 x 30 cm card laid landscape on the Eazi-score board and score at lines 5 & 6, fold this in and repeat to give the folder with spines at each side and a closing flap. I cut another 2 pieces of card slightly narrower and, with the edge against line 1, score at line 5, fold in and repeat twice, cut off excess and stick these inside the main folder. 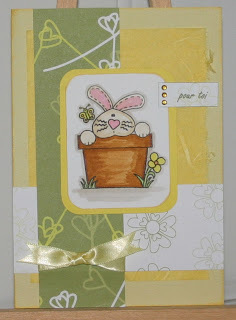 I used ribbon secured under the inner cards to hold it closed and added the patterned paper and photos. 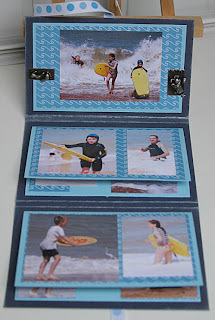 I have made some as ready-to-add-photos to sell at a coming craft fair so wanted to do a demo one: I chose our few days camping on the French Ile d'Oleron last summer as the theme. This is how it opens out: You can see the construction here - Very simple. It was sorting out which photos I wanted to use and sizing them that took ages to do - It holds loads more than you'd think a little album would: This is the back page which is a vintage map I found on the net and printed along with the photos. The closed size is A6 (10*15cm / 4 x 6 "). 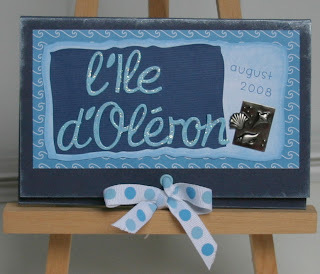 I have no idea who makes the paper or the metal embellishments but the dark card and ribbon are PaperMania, the pale card is Bazzil and the inked edges is with Brilliance Pearlescent Blue. Sorry to go AWOL but haven't felt very sociable lately: My neice who has had leukaemia for nearly 10 years now is really ill at the moment and the hospital have just about ran out of treatments as nothing tried, including a bone marrow transplant, has fully worked so they keep her on a 'maintenance dose' of chemo. Please pray for her. In the meantime, I have been keeping busy making, selling, designing .... I am hopping over to UK next week to go to the NEC craft trade fair (couldn't make CHA this year - I wish!) and to see my family. I'll try to blog more this week and set some up for next week too. Catching up with a 'tag' from Gill, here's my 6th picture of the 6th album in our 'photos' folder: It's a shot my husband took in October on a school trip with my son's class to an old school where they have preserved the features of 50+ years ago so they practiced writing with ink quills, etc. My son came back with 'guess what they used to do in school in those days...' comments and my husband came back with 'I remember when we used to ...' - Generation gap!